Rocking it in downtown Oakland since 2008, Awaken Cafe & Roasting is a community coffee-house, espresso bar, organic restaurant, beer & wine bar, and event venue. But mainly we are here to help bring people together to launch what’s next for Oakland and the world. And we might as well #drinkgoodcoffee while we’re at it. 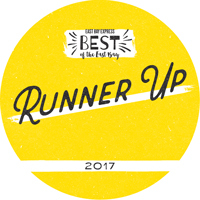 We’re honored to have been voted BEST CAFE or RUNNER UP by the readers of the East Bay Express in 2013, 2014, 2015, 2017 and 2018. Thank you! We post ON INSTAGRAM. LIKE ALL THE TIME. © 2019, Awaken Cafe LLC. All rights reserved.